This is a glorious time to be a Star Wars fan. After the long drought after Return of the Jedi, we now have an abundance of Star Wars riches from the fantastic television shows "Clone Wars" and more recently "Rebels," and the return of the saga with last year's The Force Awakens and now the missing chapter between Revenge of the Sith and A New Hope - Rogue One which is the first of a series of anthology films that will explore the universe away from the main saga. From this point forward, we will be getting one new Star Wars film per year for the foreseeable future. And if they are as good as Rogue One is, Disney can have my money every time. Now that the previously canon stories have been kicked to the curb, every story is up for grabs for reinvention. Although the computer game Star Wars: Dark Forces allowed me (playing as Kyle Katarn) to steal the Death Star plans for the Rebellion, that's no longer the case. Which by the way, is not cool as I worked hard to get those plans! Instead, Lucasfilm decided someone much more attractive than me named Jyn Erso (Felicity Jones) and her ragtag group were given the mission. Much has been written about how Rogue One's plot and character arcs changed during filming and post-production so even their story has been modified somewhat. 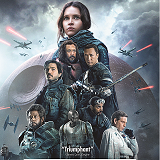 The movie starts with a flashback to fifteen years earlier when Jyn and her parents Galen (Mads Mikkelson) and Lyra (Valene Kane) were hiding on the the planet Lah'mu, in the hope that the Empire and in particular her father Galen's former boss Orson Krennic (Ben Mendelsohn) won't find them. When Krennic and his death troopers do find them, it ends in tragedy and Jyn's life changes forever. When the story picks back up, Jyn is incarcerated by the Empire, until some Rebel operatives rescue her so that she can help them talk to a former ally of the Rebellion named Saw Gerrera (Forest Whitaker) who has chosen a more ruthless way to fight the Empire. 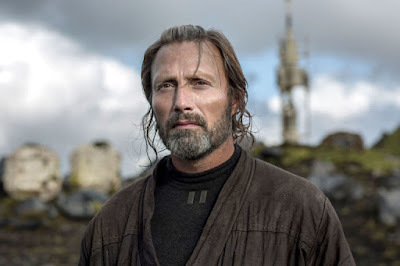 The Rebellion is aware that an Imperial pilot named Bodhi Rook (Riz Ahmed) has defected and claims to have news from Galen Erso himself. Thanks to Rebel spy Cassian Andor (Diego Luna), they are also aware that Kyber crystals are being stolen from the city of Jedha to power a massive Imperial weapon that's capable of destroying planets. 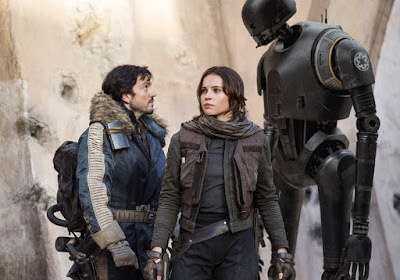 Jyn, Cassian, and his reprogrammed Imperial droid K-2S0 (Alan Tudyk) travel to Jedha and they arrive just before the Death Star does. Jyn has only enough time to learn that her father is still alive and in Imperial hands. In a pre-recorded hologram, he tells Jyn about the Death Star and that he's built in a hidden vulnerability that can destroy it. That means Jyn and her team need to go to the Imperial security complex on Scarif to get the Death Star plans before it's too late to stop the Empire. I loved Rogue One as it not only blazes its own path in the Star Wars universe, but it also deftly passes the torch to A New Hope and fills in many gaps that have only been alluded to up till now. It also opens up a lot of new conversations between fans because we have been looking at things from a certain point of view and this film in some ways really changes those viewpoints. For example, the lightsaber duel between Darth Vader and Obi-Wan Kenobi in A New Hope wasn't that intense compared to all of the other battles we've seen. I for one assumed that it was because both were slowed by age and injuries, but after seeing Vader at his most merciless in this movie and Obi-Wan in "Star Wars: Rebels," that assumption has been blown out of the water. Now, we understand that both men were holding back in their final duel which changes everything. I also liked all of the in-jokes in the movie as well as the diverse cast. The entire movie is fantastic but the final thirty minutes are absolutely incredible. I could watch that on a loop for days (especially the scene with Vader). A lot of people complained about the CGI Grand Moff Tarkin and Princess Leia but I thought they were both done very well, especially Tarkin, where they had a life mask of the later Peter Cushing that helped quite a bit. Both of the characters were essential to the film and I applaud the guts it took for ILM to take on that challenge and the intestinal fortitude of Lucasfilm and Disney to go for it. It's shocking to me that I enjoyed this film more than The Force Awakens, thanks to the ending of that film that still pisses me off and its treatment of Han Solo. If you're a fan of Star Wars, you will love this film if you haven't already seen it. This 1080p transfer is amazing! 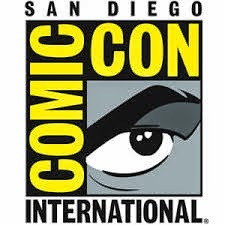 I am so happy to report that it's reference quality but I can't say that I'm surprised since Disney and Lucasfilm always provide great presentations. The detail is superb and the colors all jump off the screen. Black levels are pitch black and there's no defects or blemishes to be seen anywhere. Fans will be very happy with this disc. Rogue One's DTS-HD Master Audio 7.1 track is just as good as the video presentation. While I do wish that this was a Dolby Atmos track, there's no denying that this is among the finest 7.1 mixes I've heard. Every familiar sound effect is delivered in perfect clarity along with crystal clear dialogue. Michael Giacchino's score is blended well with the rest of the sound design and it's always a thrill to hear John Williams iconic score come through loud and clear at the appropriate moments. This mix is also without a doubt reference quality too. This is a three disc set with the movie on one disc, the bonus features are on the second disc, and the DVD version of the film is on the third. A digital copy of the film along with all of the extras is also included. I really like now that the extras are being added to the digital copies as that's a classy move. I really wish these extras were more in depth and there were more of them. All extras are also in high definition. A Rogue Idea - We hear how this all started with John Knoll's idea for the film and how he pitched it to Kathy Kennedy and the Lucasfilm story group. 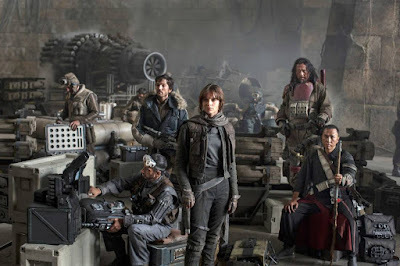 We also hear about the hiring of director Gareth Edwards and his love of Star Wars. Jyn: The Rebel - A short look at the character of Jyn Erso with comments from Edwards and actress Felicity Jones. Cassian: The Spy - An even shorter look at the character of Cassian Andor and the actor who played him - Diego Luna. We learn that he was always Gareth Edward's for the role. K-2SO: The Droid - Out of the extras focused on the characters, this one was my favorite. Not only because I'm a big fan of actor Alan Tudyk, but also because it's the best one. It's funny, it's the best made, and it also gives us a lot of behind the scenes looks of the filming. Baze & Chirrut: Guardians of the Whills- The two actors talk about how and why they got involved in the movie and their character's relationship in the movie and the choices they made to create their characters. Bodhi & Saw: The Pilot & The Revolutionary - We seer a lot of Riz Ahmed's audition films that he spammed the director with and his approach to the character. Forest Whitaker talks about how he researched his character's history from "Star Wars: The Clone Wars." 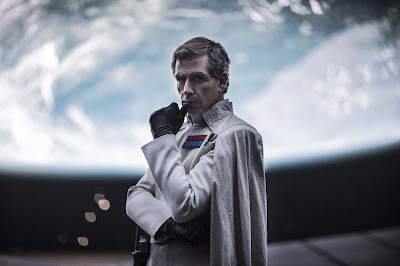 The Empire - We hear about the main Imperial characters including: Galen Erso, Orson Krennic, Grand Moff Tarkin, and of course Darth Vader. I wish there was a lot more about Vader included. Visions of Hope: The Look of Rogue One - We hear how they tried to create a balanced look to the film so that it's fresh but still familiar. The Princess & The Governor - I really wanted to really get into this but not much was included. We hear the basics on how they brought Leia and Tarkin to life through CGI. Epilogue: The Story Continues - A look at the film's premiere and comments from fans with clips from the film. Rogue Connections - This is another great concept for a special feature, but once again it's really brief. We learn some secrets from the movie such as cameos, the meanings behind some character names and more. 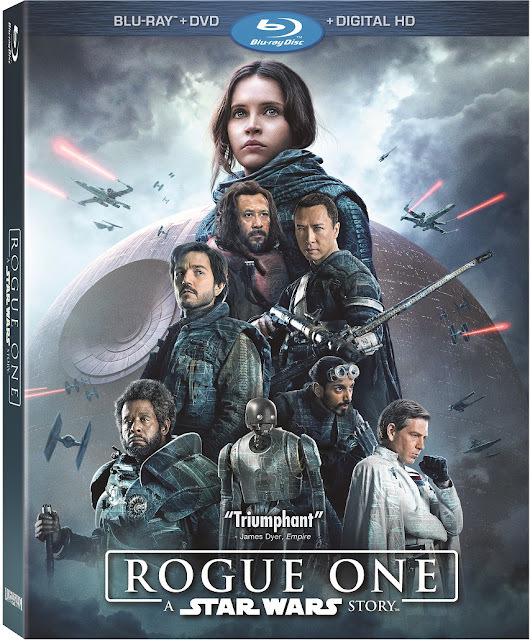 Rogue One is a fantastic film and this Blu-ray offers reference quality video and audio presentations. I wish I could say that the extras were equally good, but sadly that's not the case. I'm assuming a more substantial release may happen in the future. At least I hope it will happen. In the meantime, I heartily recommend this Blu-ray!